An integrated fridge is cleverly hidden behind a panel that matches your kitchen cabinetry for sleek, modern lines and seamless kitchen style. Building your coffee machine and microwave into your cabinetry at eye level alongside your oven(s) creates a clutter-free benchtop and modern appliance bank. A flat cooktop surface that sits flush with your benchtop creates a modern, minimalist look. Pans are heated magnetically so the cooktop stays touch-cool, and it’s the fastest way to cook. Modern gas on glass designs look so sleek. Gas is the preferred cooktop of most chefs because flames heat pan sides to cook food faster, and heat can be instantly adjusted. A rangehood that’s completely concealed or slides out when you’re cooking means you can extract cooking odours and vapours and keep a clean line with your cabinetry. Hiding your dishwasher behind a panel that matches your cabinetry means your kitchen cabinetry is uninterrupted for a streamlined, modern look. Appliances with matching designs makes everything work together. Ovens, fridges, kettles, toasters, mixers and coffee machines in stainless steel and/or black create a modern, matching kitchen. A French door fridge is perfect for families, with more storage space, wide shelves and lots of compartments so it’s easy to find everything fast. A built-in ice and water dispenser gives you the convenience of cold drinks from the front of the fridge. A double pyrolytic oven gives families more space to cook more at once and the easiest way to clean the oven. After the self-cleaning cycle, just wipe away the ash with a damp cloth. Magnetic field-based technology heats pans directly so the cooktop stays touch-cool, making it the safest and fastest way for families to cook. Choosing a dishwasher that holds more place settings means you can fit more in every load, while a double DishDrawer allows you to wash one drawer while you fill the other so dishes don’t pile up. It’s easier to feed and get everyone out the door on busy weekdays and make all the toast for lazy weekend fry-ups when you can make four slices of toast at once. Mums and Dads with busy lives will wonder how they ever lived without a coffee machine once they have one and can brew their favourites at home every day. Making birthday cakes, cupcakes and other family treats is so much easier with a mixer to do all the mixing. Choose a design that matches your other appliances for coordinated style. A stainless steel fridge makes a cool metallic statement in your kitchen and helps you create a commercial-style kitchen. A coffee machine that’s built into your cabinetry at eye level makes it easy to brew your favourite coffee in a flash and a stainless steel finish adds industrial chic. A big, chunky stainless steel cooker creates an industrial kitchen vibe and gives you lots of space to cook in the oven and on the cooktop. A large, statement canopy rangehood is the perfect match for a large, freestanding cooker. It powerfully extracts cooking odours and vapours with industrial style. Choosing stainless steel finishes for your fridge, oven, cooktop, rangehood, dishwasher and benchtop appliances will enhance your kitchen’s the industrial style of your kitchen. A big, gas cooktop with a large wok burner allows you to cook at high heat in a flash and gives your kitchen an industrial edge. Coordinate appliances with the same finish, whether you want white, stainless steel or black, with your oven directly under a matching cooktop that’s the same width. If there’s enough space, a freestanding cooker with an interesting design and colour becomes the focal point and adds character to a Scandinavian kitchen. An integrated dishwasher is hidden away behind a panel so your cabinetry is uninterrupted and sets the Scandinavian scene. Gas and induction cooktops both work well in a Scandinavian kitchen. Choose a gas cooktop that matches your other appliances, or an induction cooktop that sits flush with your benchtop. An undermount rangehood or slideout rangehood are hidden out of sight (until in use) so your kitchen is uncluttered and has Scandinavian-style simplicity. A double oven with a minimalist design allows you to cook more at the same time, which is perfect for those who cook for family and friends a lot. Grouping ovens with a built-in microwave and coffee machine in a bank at eye level gives you easy access to everything and keeps your bench clear for Scandinavian minimalism. Hiding an integrated fridge behind your kitchen cabinetry prevents the country style from being broken by a modern fridge and enhances your overall kitchen design. Similarly, an integrated dishwasher sits behind a panel that matches your cabinetry so you have clean kitchen cabinetry lines and uninterrupted country style. An all-in-one cooker with lots of gas burners on top and a wide oven underneath creates a stylish cooking hub and becomes the hero of any country kitchen. A canopy rangehood works well over a freestanding cooker and adds to the country style, or the rangehood can be concealed so the cooker is the focal point. 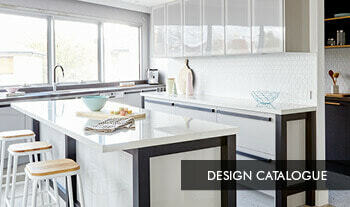 Choose benchtop appliances in matching, classic designs and make them a feature. A timeless kettle, toaster, mixer and coffee machine will enhance any country-style kitchen; whether you’re going for a Hamptons or rustic look. Perfect for: Any kitchen style. Gas or electric in a range of finishes (white, stainless steel, black etc). Built in under the cooktop or at eye level for less bending and more safety. Pyrolytic ovens turn food splashes and grease into easy-to-wipe-away ash. Some ovens have steam-cooking technology for healthy, tasty cooking. A large, wide oven allows you to cook big family roasts and lasagnes. A small, compact oven underneath the benchtop suits smaller kitchens. An oven under a cooktop that’s the same width creates a neat cooking hub. New electrical or gas lines may be needed before the oven is installed. 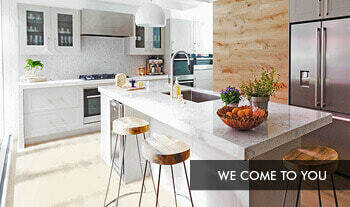 Perfect for: Modern and Scandinavian kitchens, entertainers and families. Double the oven space for cooking mains and desserts at the same time. Cook in one oven and warm the plates in the other oven. Both ovens can be the same size or one oven can be bigger than the other. Pyrolytic ovens have a self-cleaning cycle so only ever need a quick wipe. Group with a built-in microwave and coffee machine in an appliance bank. Only available in electric (no gas double ovens). Perfect for: Industrial, Scandinavian and country kitchens. The oven and cooktop are combined in an all-in-one cooking hub. Available in gas, electric, and dual fuel (electric oven and gas cooktop). Perfect for: Small apartments and studios with no space for a built-in oven. Sits on top of the bench and just plugs into your power point. Perfect for: Regular entertainers and those who live in colder climates. Keeps the food and plates warm until it’s time to serve. A stylish statement piece for any kitchen. Perfect for: Industrial and country kitchens. Slides in and out and is hidden when not being used. Perfect for: Modern, Scandinavian, and family kitchens. Integrated into the kitchen cabinetry above and out of sight. 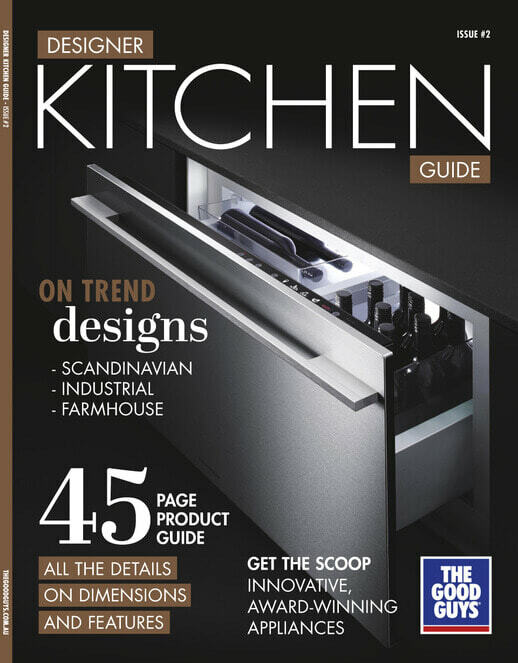 Perfect for: Modern and Scandinavian kitchens. The whole dishwasher is completely hidden behind your kitchen cabinetry so it blends in seamlessly, with controls on the inside. Perfect for modern, country and Scandinavian kitchens. Only the control panel is visible, the rest is hidden behind a panel that matches your kitchen cabinetry. Perfect for modern and Scandinavian kitchens. The dishwasher is built into your cabinetry for a flush, no-gap designer look. Perfect for industrial, modern and family kitchens. Slides into the free space in your kitchen so it’s easy to install and take with you when you move. Perfect if you’re renting. The drawer slides out and can be positioned at waist height for less bending. A double DishDrawer washes one drawer while you fill the other, and can do two different cycles at the same time. Perfect for small apartments, families, entertainers and people with bad backs. Dishwashers need to be connected to your water supply. The power cord length determines where your power points need to go. New water and/or electrical lines may be needed before it can be installed. Built into your cabinetry at eye level for everyday convenience and a clutter-free benchtop. A stylish microwave design that can enhance the overall style of your kitchen, or be hidden away in the butler’s pantry. Built-in microwaves need to be built into your kitchen cabinetry. New power points may be needed before the microwave is installed. Making matching kitchen benchtop appliances a feature creates cohesive kitchen style. Vintage-inspired kettle and toaster designs are perfect for a country kitchen, while stainless steel suits industrial, Scandinavian and modern kitchens. If your kettle and toaster will be hidden away in a butler’s pantry or behind a roller shutter to declutter the kitchen benchtop, functionality will be the primary focus. Preferred by most chefs because the flames heat the sides of the pan so food cooks faster, and the heat can be instantly adjusted. Perfect for industrial, modern, Scandinavian and family kitchens. Perfect for modern, Scandinavian and family kitchens because it sits flush with the benchtop, and magnetic cooking technology makes it the fastest and safest way to cook (because the cooktop surface stays touch cool). Powered by electricity, this traditional type of cooktop is the most affordable to buy. Electric powered with a flat, easy-to-clean ceramic surface that suits modern kitchen designs. An oven and cooktop in one combined appliance that suits Scandinavian, country and industrial kitchens. Sits flush with the benchtop, creating clean lines, and magnetic cooking technology makes it the fastest and safest way to cook (the cooktop surface stays touch cool). A cooktop above an oven that’s the same width creates a neat cooking hub. New electrical or gas lines may be needed before the cooktop is installed. The big, wide shelves store more—pizza boxes platters, drinks, and cakes—perfect for families and entertainers. The long, vertical fridge and freezer compartments sit side by side and have lots of narrow shelves. The fridge is above the freezer so you can see and access everything without bending down. The most traditional design and least expensive to buy; the freezer sits above the fridge. Perfect for wine lovers and entertainers who want their wine served at just the right temperature. Fridges with an ice/water dispenser need to be connected to your water. New water or electrical lines may be needed before the fridge is installed. For quick capsule coffee, automatic convenience, or manual coffee-making control you can take with you when you move. A vintage-inspired design is perfect for a country or retro-style kitchen. A vibrant coffee machine design brings a pop of colour to any kitchen. Built-in coffee machines need to be connected to your water supply. A stylish stainless steel, vintage-inspired or colourful mixer that matches your kettle, toaster and coffee machine creates kitchen continuity and enhances the style of kitchen you’re trying to achieve. Functionality is more important than design if your mixer will be in a butler’s pantry or stored in a cupboard. Once you’ve chosen your appliances, you can give your kitchen designer a list of all your appliances with their dimensions so they can design your kitchen around the appliances you want. Picking your appliances first can save you time and money, and will ensure your new kitchen is the one you’ve been dreaming of.